Welcome to the www.savemall.my website (the "Site"). These terms and conditions ("Terms and Conditions") apply to the Site, SAVEMORE MALL (002517935-U), and all of its divisions, subsidiaries, and affiliate operated Internet sites which reference these Terms and Conditions. “SAVEMALL” means SAVEMORE MALL, a company incorporated in Malaysia under registration number 002517935-U and having its registered address at B-11-03A, SKY VISTA RESIDENSI, JALAN SENJOLONG, TAMAN BUKIT RIA,CHERAS, 56100 Kuala Lumpur, Malaysia. Credit card payments that you make through the site will be processed by our payment service provider, a company registered in the Malaysia. In addition to any other legal or equitable remedies, we may, without prior notice to you, immediately terminate the Terms and Conditions or revoke any or all of your rights granted under the Terms and Conditions. Upon any termination of this Agreement, you shall immediately cease all access to and use of the Site and we shall, in addition to any other legal or equitable remedies, immediately revoke all password(s) and account identification issued to you and deny your access to and use of this Site in whole or in part. Any termination of this agreement shall not affect the respective rights and obligations (including without limitation, payment obligations) of the parties arising before the date of termination. You furthermore agree that the Site shall not be liable to you or to any other person as a result of any such suspension or termination. If you are dissatisfied with the Site or with any terms, conditions, rules, policies, guidelines, or practices of SAVEMORE MALL (002517935-U), in operating the Site, your sole and exclusive remedy is to discontinue using the Site. “SAVEMALL” means SAVEMORE MALL, a company incorporated in Malaysia under registration number 002517935-U and having its registered address at B-11-03A, SKY VISTA RESIDENSI, JALAN SENJOLONG, TAMAN BUKIT RIA,CHERAS, 56100 Kuala Lumpur, Malaysia. 2.1 The supply of Goods by SAVEMALL to the Buyer under any Contract shall be subjected to these Conditions which shall govern the Contract to the exclusion of any other terms and conditions contained or referred to in any documentation submitted by the Buyer or in correspondence or elsewhere or implied by trade custom practice or course of dealing. 2.2 Any information made available in SAVEMALL’s website connection with the supply of Goods, including photographs, drawings, data about the extent of the delivery, appearance, performance, dimensions, weight, consumption of operating materials, operating costs, are not binding and for information purposes only. In entering into the Contract the Buyer acknowledges that it does not rely on and waives any claim based on any such representations or information not so confirmed. 2.3 No variation to these Conditions shall be binding unless agreed in writing between the authorised representatives of the Buyer and SAVEMALL. 2.4 Any typographical clerical or other error or omission in any quotation, invoice or other document or information issued by SAVEMALL in its website shall be subject to correction without any liability on the part of SAVEMALL. 3.1 Order acceptance and completion of the contract between the Buyer and SAVEMALL will only be completed upon SAVEMALL issuing a confirmation of dispatch of the Goods to the Buyer. For the avoidance of doubt, SAVEMALL shall be entitled to refuse or cancel any order without giving any reasons for the same to the Buyer prior to issue of the confirmation of dispatch. SAVEMALL shall furthermore be entitled to require the Buyer to furnish SAVEMALL with contact and other verification information, including but not limited to address, contact numbers prior to issuing a confirmation of dispatch. 3.2 No concluded Contract may be modified or cancelled by the Buyer except with the agreement in writing of SAVEMALL and on terms that the Buyer shall indemnify SAVEMALL in full against all loss (including loss of profit) costs (including the cost of all labour and materials used) damages charges and expenses incurred by SAVEMALL as a result of the modification or cancellation, as the case may be. The price of the Goods and/or Services shall be the price stated in SAVEMALL’s website at the time which the Buyer makes its offer purchase to SAVEMALL. The price excludes the cost of packaging and delivery charges, any applicable goods and services tax, value added tax or similar tax which the Buyer shall be liable to pay to SAVEMALL in addition to the price. 5.1 The Buyer shall be entitled to make payment for the Goods pursuant to the various payment methods set out in SAVEMALL’s website. The terms and conditions applicable to each type of payment, as contained in SAVEMALL's website, shall be applicable to the Contract. Credit Card payment is possible for all Buyers. 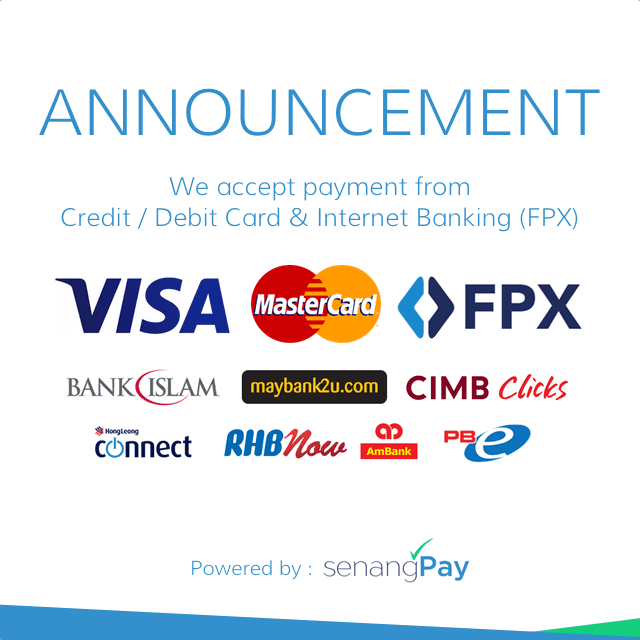 When the Buyer places an order with Credit Card on the SAVEMALL website, the transaction is handled by SenangPay. This system is certified and allows SAVEMALL to accept payments such as Visa and MasterCard and. All credit card numbers shall be protected by means of industry-leading encryption standards. SAVEMALL accepts all Malaysian Visa and MasterCard debit cards where subject to bank availability. All debit card numbers shall be protected by means of industry-leading encryption standards. i. By choosing this payment method, the Buyer shall transfer the payment for the Goods to a SAVEMALL’s account for the total amount of the Buyer’s purchase (including any applicable taxes, fees and shipping costs). The transaction must be payable in Ringgit Malaysia. SAVEMALL, in its sole discretion, may refuse this payment option service to anyone or any user without notice for any reason at any time. ii. For the time being, SAVEMALL accepts online bank transfers from AmBank, Bank Islam, CIMB Bank, Hong Leong, Maybank, Public Bank, RHB, BSN. iii. If the Buyer decides to cancel his/her orders twenty four (24) hours after the relevant order has been confirmed and prior to shipment, SAVEMALL shall be entitled to impose a minimum of 15% of the total amount of the purchase price of the relevant Goods and the processing fee as administrative fees, in addition to the transaction fees charged by the Credit Card company. The balance after deduction of the administrative fees and the transaction fees will be refunded to the Buyer. iv. In the event of cancellation of the Buyer’s Credit Card account, any unpaid portion of the purchase price of the relevant purchased Goods shall become immediately due and payable. Insofar as is possible, this outstanding sum shall be debited to the Buyer’s Credit Card without further reference payable by the Buyer. Cash on Delivery (Pay cash upon delivery) is available within the certain region in Klang Valley against a fee of RM 6 per order. SAVEMALL reserves the right to schedule the delivery time. The Goods will only be handed over to the Buyer upon full payment in cash by the Buyer. 6.2 SAVEMALL has the right at any time to sub-contract all or any of its obligations for the sale/delivery of the Goods to any other party as it may from time to time decide without giving notice of the same to the Buyer. 6.3 Any dates quoted for delivery of the Goods are approximate only. The time for delivery/performance shall not be of the essence, and SAVEMALL shall not be liable for any delay in deliv-ery or performance howsoever caused. 6.4 If SAVEMALL has failed to deliver the Goods in accordance with the Contract or within a reasonable time, the Buyer shall be entitled, by serving written notice on SAVEMALL, to demand performance within a specified time thereafter, which shall be at least 14 days. If SAVEMALL fails to do so within the specified time, the Buyer shall be entitled to terminate the Contractin respect of the undelivered Goods and claim compensation for actual loss and expense sustained as a result of SAVEMALL’s non-performance, which was foreseeable at the time of conclusion of the Contract and resulting from the usual course of events, subject always to the limitations set out in Condition 12.4. 7.1 Risk of damage to or loss of the Goods shall pass to the Buyer at the time of delivery or if the Buyer wrongfully fails to take delivery of the Goods, the time when SAVEMALL has tendered delivery of the Goods. 7.2 Notwithstanding delivery and the passing of risk in the Goods or any other provision of these Conditions the property in the Goods shall not pass to the Buyer until SAVEMALL has received in cash or cleared funds payment in full of the price of the Goods and all other goods agreed to be sold by SAVEMALL to the Buyer for which payment is then due. 7.3 Until such time as the property in the Goods passes to the Buyer, the Buyer shall hold the Goods as SAVEMALL's fiduciary agent and bailee and shall keep the Goods separate from those of the Buyer. 7.4 The Buyer agrees with SAVEMALL that the Buyer shall immediately notify SAVEMALL of any matter from time to time affecting SAVEMALL’s title to the Goods and the Buyer shall provide SAVEMALL with any in-formation relating to the Goods as SAVEMALL may require from time to time. 7.5 Until such time as the property in the Goods passes to the Buyer (and provided the Goods are still in existence and have not been resold) SAVEMALL shall be entitled at any time to demand the Buyer to deliver up the Goods to SAVEMALL and in the event of non-compliance SAVEMALL reserves it’s right to take legal action against the Buyer for the delivery up the Goods and also reserves its right to seek damages and all other costs including but not limited to legal fees against the Buyer. 7.6 The Buyer shall not be entitled to pledge or in any way charge by way of security for any indebtedness any of the Goods which remain the property of SAVEMALL but if the Buyer does so all moneys owing by the Buyer to SAVEMALL shall (without prejudice to any other right or remedy of SAVEMALL) forthwith become due and payable. 7.9 The Buyer shall indemnify SAVEMALL against all loss damages costs expenses and legal fees in-curred by the Buyer in connection with the assertion and enforcement of SAVEMALL's rights under this condition. 8.2 Subject to this Condition 8, SAVEMALL warrants that the Goods will correspond with their specification at the time of delivery, and agrees to remedy any non-conformity therein for a period of 7 days commencing from the date on which the Goods are delivered or deemed to be delivered ("Warranty Period"). Where the Buyer is dealing as a consumer (within the meaning of the Sale of Goods Act and the Consumer Protection Act), SAVEMALL further gives to the Buyer such implied warranties as cannot be excluded by law. (a) No condition is made or to be implied nor is any warranty given or to be implied as to the life or wear of the Goods supplied or that they will be suitable for any particular purpose or use under any specific conditions, notwithstanding that such purpose or conditions may be known or made known to SAVEMALL. (c) SAVEMALL binds itself only to deliver Goods in accordance with the general description under which they were sold, whether or not any special or particular description shall have been given or shall be implied by law. Any such special or particular description shall be taken only as the expression of SAVEMALL's opinion in that behalf. SAVEMALL does not give any warranty as to the quality state condition or fitness of the Goods. (d) SAVEMALL shall be under no liability for the following measures and actions taken by the Buyer or third parties and the consequences thereof: improper remedy of de-fects, alteration of the Goods without the prior agreement of SAVEMALL, addition and insertion of parts, in particular of spare parts which do not come from SAVEMALL. (e) SAVEMALL shall be under no liability in respect of any defect arising from unsuitable or improper use, defective installation or commissioning by the Buyer or third parties, fair wear and tear, wilful damage, negligence, abnormal working conditions, defective or negligent handling, improper maintenance, excessive load, unsuitable operating materials and replacement materials, poor work, unsuitable foundation, chemical, electro-technical/electronic or electric influences, failure to follow SAVEMALL's instructions (whether oral or in writing) misuse or alteration or repair of the Goods without SAVEMALL's approval. (f) SAVEMALL is not liable for any loss damage or liability of any kind suffered by any third party directly or indirectly caused by repairs or remedial work carried out without SAVEMALL’s prior written approval and the Buyer shall indemnify SAVEMALL against each loss liability and cost arising out of such claims. (g) SAVEMALL shall be under no liability under the above warranty (or any other warranty condition or guarantee) if the total price for the Goods has not been paid in cleared funds by the due date for payment. (h) SAVEMALL shall be under no liability whatsoever in respect of any defect in the Goods arising after the expiry of the Warranty Period. 8.2.2 Any claim by the Buyer which is based on any defect in the quality or condition of the Goods or their failure to correspond with specification shall be notified to SAVEMALL within seven days from the date of receipt of the Goods or (where the defect or failure was not apparent on reasonable inspection) within a reasonable time after discovery of the defect or failure. During use, the Goods shall be monitored constantly with regard to safety and defects. If there are even slight reservations concerning the suitability for use or the slightest reservations concerning safety, the Goods must not be used. SAVEMALL shall be given written notification immediately, specifying the reservations or the defect. However in no event shall the Buyer be entitled to reject the Goods on the basis of any defect or failure, except where the failure is such that the Goods delivered are of a fundamentally different nature than those which SAVEMALL had contracted to deliver. 8.2.3 If the Buyer does not give due notification to SAVEMALL in accordance with the Condition 8.2.2, SAVEMALL shall have no liability for any defect or failure or for any consequences re-sulting therefrom. Where any valid claim in respect of any of the Goods which is based on any defect in the quality or condition of the Goods or their failure to meet a specification is notified to SAVEMALL in accordance with Condition 8.2.2, the non-conforming Goods (or part thereof) will be repaired or replaced free of charge as originally ordered. Where the Goods have not been repaired or replaced within a reasonable time, despite a written warning from the Buyer, the Buyer shall be entitled to a reduction of the price in proportion to the reduced value of the Goods, provided that under no circumstance shall such reduction exceed 15% of the price of the affected Goods. In lieu of repair or replacement, SAVEMALL may, at its sole discretion, grant such a reduction to the Buyer. Upon a repair, replacement or price reduction being made as aforesaid, the Buyer shall have no further claim against SAVEMALL. 8.2.4 When SAVEMALL has provided replacement Goods or given the Buyer a refund, the non-conforming Goods or parts thereof shall become SAVEMALL’s property. 9.2.2 terminate any Contract so affected with immediate effect by written notice to the Buyer and SAVEMALL shall not be liable for any loss or damage suffered by the Buyer as a result thereof. 10.1.4 SAVEMALL reasonably apprehends that any of the events mentioned above is about to occur in relation to the Buyer and notifies the Buyer accordingly. 10.2If this condition applies then without prejudice to any other right or remedy available to SAVEMALL, SAVEMALL shall be entitled to cancel the Contract or suspend any further delivery/performance under the Contract without any liability to the Buyer and if Goods have been delivered but not paid for the price shall become immediately due and payable notwithstanding any previous agreement or arrangement to the contrary. Any notice required or permitted to be given by either party to the other under these Conditions shall be in writing addressed, if to SAVEMALL, to its registered office or principal place of business and if to the Buyer, to the address stipulated in the relevant offer to purchase. 12.1 SAVEMALL shall accept liability to the Buyer for death or injury resulting from its own or that of its employees' negligence. Save as aforesaid, SAVEMALL’s liability under or in connection with the Contract shall be subject to the limitations set out in this Condition 12. 12.2 SAVEMALL shall be under no liability whatsoever where this arises from a reason beyond its reasona-ble control as provided in Condition 9 or from an act or default of the Buyer. 12.3 In no event shall SAVEMALL be liable for loss of profit or goodwill, loss of production or revenue or any type of special indirect or consequential loss whatsoever (including loss or damage suffered by the Buyer as a result of an action brought by a third party) even if such loss were reasonably foreseeable or SAVEMALL had been advised of the possibility of the Buyer incurring the same. 12.4 Where time of performance has been agreed by SAVEMALL becomes the essence of the Contract by means of notice by the Buyer to SAVEMALL, as provided for in Clause 6.4, and SAVEMALL fails to comply with its obligations in due time, so that the Buyer becomes entitled to compensation in accordance with Condition 6.4, SAVEMALL’s liability shall be limited to an amount of ½% for each full week of delay, in total to a maximum cumulative amount of 5%, of the value of the delayed Goods. 12.5 The remedies set out in Condition 8 are the Buyer’s sole and exclusive remedies for non-conformity of or defects in the Goods or Services and SAVEMALL’s liability for the same shall be limited in the manner specified in Condition 8. 12.6 Without prejudice to the sub-limits of liability applicable under this Condition 12 or elsewhere in these Conditions, SAVEMALL’s maximum and cumulative total liability (including any liability for acts and omissions of its employees agents and sub-contractors) in respect of any and all claims for defective performance, breach of contract, compensation, indemnity, tort, misrepresentation, negligence at law or equity and any other damages or losses which may arise in connection with its performance or non-performance under the Contract, shall not exceed the total Contract price. 12.8 No action shall be brought by SAVEMALL later than 6 months after the date it became aware of the circumstances giving rise to a claim or the date when it ought reasonably to have become aware, and in any event, no later than 6 months after the end of the Warranty Period. 13.1On or at any time after the occurrence of any of the events in condition 13.2 SAVEMALL may stop any Goods in transit, suspend further deliveries to the Buyer and exercise its rights under Condition 7 and/or terminate the Contract with the Buyer with immediate effect by written notice to the Buyer. 14.2 No waiver by SAVEMALL of any breach of the Contract by the Buyer shall be considered as a waiver of any subsequent breach of the same or any other provision. 14.7 Notwithstanding Clause 14.6, SAVEMALL shall be entitled to commence court legal proceedings for the purposes of protecting its intellectual property rights and confidential information by means of injunctive or other equitable relief. 14.9 SAVEMALL reserves their right to these terms and conditions of sale at any time.